The weekend is almost upon us, and we’re back with some ideas to keep you busy. First off, tonight the Trustees of the Reservations hold the first of their 3rd Annual Celebrity Chef Dinner Series at Castle Hill hosted by the Trustees of the Reservations. Tonight’s dinner features Chef Robert Grant of The Butcher Shop in Boston, and the Dec. 2 dinner will feature Chef Sam Hunt of 15 Walnut in Hamilton. On Sunday, there are fun things happening all over the North Shore. In Peabody, you’ll find the North Shore Bazaar 2010. While it’s not limited to food and drink, there will be more than 25 vendors offering organic, fair trade, locally resourced, or locally produced gifts and services. Lunch will be available as well. Rockport Music is hosting a wine tasting at 4:00 on Sunday, offering attendees the opportunity to sample nine of the best French, German, and Californian wines, accompanied by a culinary creation, and then evaluate and vote on the best overall pairing of wine and food. California’s Benchmark Wine Group will lead the tasting, and Chef Ron Weisheit and Pastry Chef Rhonda Weisheit of Newburyport’s Pralines & Pepper will provide the food and some insight into the pairings. 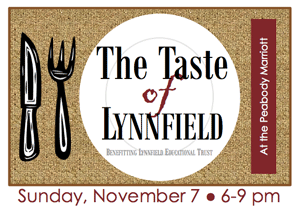 Also on Sunday evening, the 17th Annual Taste of Lynnfield will be held at the Peabody Marriott, hosted by Lynnfield Educational Trust (LET), a non-profit that provides financial support to enhance the educational experience for all children in the Lynnfield Public schools. This year, attendees will have the opportunity to sample the culinary talents of some outstanding area restaurants, including The Blue Ox (Lynn), 15 Walnut (Hamilton), Masa (Woburn), Jalapeno’s Mexican Restaurant (Gloucester), Turbine Wine Bar (Lynn), The Red Rooster (Lynnfield), T&L Wine Cellar (Lynnfield and Peabody), Cafe Jag’s (Wakefield), FINZ (Salem), New England Beverage (North Reading), Focaccia (Wilmington), Guilio’s Bakery (Wakefield), Mount Vernon at the Ship (Lynnfield), and Carrabba’s Italian Grill (Peabody). Last but far from least, don’t forget that Sunday marks the first night of Salem Restaurant Week. Salem has had an unprecedented number of restaurants open this year, and if you’ve been itching to get out and try some of the new kids on the block, this is your chance. The deals are good enough that after you try something new, you can go back to an old favorite as well. And here, as always, are the weekend picks from our pals in the North Shore Bloggers Consortium. Abby shares her picks, including an apples and wine fest in Ipswich, over at 5th Joy.